DESCRIPTION: Snuggling into the sheets and wrapping up in soft blankets as the day melts away can be exactly what we need. But those nights when we struggle to find rest can be pure torture. Before you toss and turn, try letting Good Night's gentle aroma soothe you to sleep. A pleasantly cozy blend that promotes calm and rest. Good Night possesses layers of individual oils, each with unique soothing properties that help you sink deeply into the pillow. Good Night is an even blend of Lavender, Sweet Marjoram, Chamomile, Bergamot, Ylang Ylang, Sandalwood, Key Lime, Lime, and Vanilla. Made with care from our top quality oils and, as always, Edens Garden essential oils are never diluted or mixed with additives. CONTAINS: Lavender (Lavandula angustifolia), Sweet Marjoram (Origanum majorana), Chamomile (Anthemis nobilis), Bergamot (Citrus bergamia), Ylang Ylang (Cananga odorata), Sandalwood (Santalum paniculatum), Key Lime (Citrus aurantifolia var. swingle), Lime (Citrus aurantifolia), Vanilla (Vanilla planifolia) BE INSPIRED: Try placing a few drops on your pillow at night or on the bottom of your feet for sweet dreams and a rested next day. 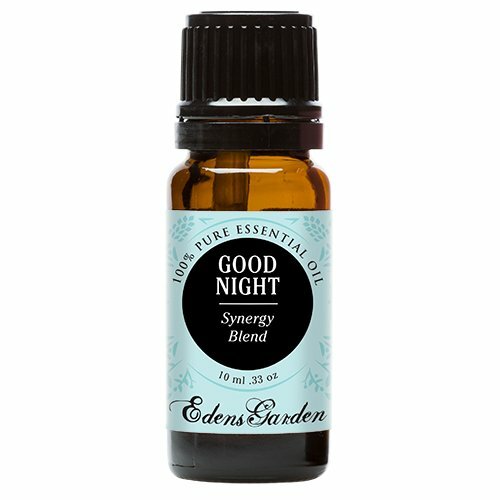 Good Night: A pleasantly cozy blend that promotes calm and rest. Good Night possesses layers of individual oils, each with unique soothing properties that help you sink deeply into the pillow. Choose a size that's best for you. Almost all of our oils are available in 5 mL, 10 mL, 30 mL, & 120 mL sizes. All oils are packaged in glass amber bottles and include a pipette dropper ensuring freshness quality and precision.If you do not find what you need, please do not hesitate to email or call- we'd love to hear from you. It is through your requests that we will expand our offerings! GC/MS Certified: Each product offered by Edens Garden goes through multiple rounds of testing. We stand by our products and take pride in offering 100% pure therapeutic grade oils without bases, fillers, additives, etc. Freshness and Quality: We control the freshness and quality of each product and ensure every oil received is brand new and from a fresh batch. We guarantee each oil to be the freshest available. Each oil is stored in a temperature sensitive room with minimal light to ensure the therapeutic properties are not compromised.